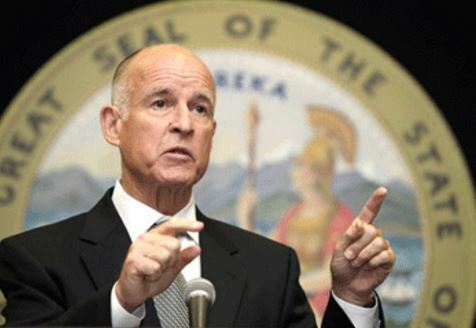 Governor Jerry Brown of California is committing treason Against the United States. He is leading a confederacy against the Federal Government and should stand trial, but of course that would be controversial. After Trump rejected the Paris Climate treaty, which had never been ratified by the Senate, the European Union announced that it would work with a climate confederacy of secessionist states in the USA. This is clearly treason and all Federal funds should be cut off from the secessionist governments of California, New York and Washington, who have unilaterally and completely illegally entered into a foreign treaty rejecting the President of the United States on the Paris Accord. Jerry Brown should be put on trial right now. He had the audacity to say: “It is a little bold to talk about the China-California partnership as though we were a separate nation, but we are a separate nation.” Perhaps there should be a referendum in the USA for CAEXIT, but let everyone votes to also kick California out of the union. Impose a water tax on all the water it needs from other states and electricity. It would soon lose most of its industry. In an interview with the Huffington Post, Jerry Brown described California as “a real nation-state” and said “We’re a powerful state government. We have nine other states that agree with us.” Brown boasted. Perhaps it is time for California to leave and they can take Pelosi and Feinstein with them and elect Hillary as President. In fact, this is a Climate Alliance of California, New York, Washington, Vermont, Massachusetts, Connecticut, Oregon, Colorado, Hawaii, Virginia and Rhode Island which is absolutely unconstitutional if they enter into any confederacy with the EU. ALL FUNDING should be cut off to these states just as they did to Iran. Brown is a slimy and slippery politician who begs for federal aide when fires rage. So much for his all powerful “real nation-state” and just keep raising those taxes hurting the average person to help Calpers and the rest of the state employees against the people. It is one thing that each state can create its own laws and punish people within the state. Then they will see as more and more businesses leave. But to sign treaties with the EU or join into a confederacy with the EU or China, that is absolutely treason. Jerry Brown should be in prison and there is no legal question about that for he has openly advocated the overthrow of the Federal government. That in itself is a crime without having to sign a treaty. Jerry Brown is so worried about the environment, but not the people. California is the highest taxed state and they still want to tax people fully upon retirement. California is a complete black hole. The people do not even realize that government has been so corrupt, that every person in California owes $93,000 at the end of 2016 to cover state employee pensions. That’s why he wants to raise gasoline taxes and space launches again to bailout state employee pensions always against the people. Shame he can’t pick up the state and move to Europe. He would still be the highest taxed state and he can have his sanctuary cities for terrorists while he is at it with the refugees and make it more interesting than Mexicans who have higher family values and work harder at least.